A bad sleep and cold and grey morning demand a hot cup of coffee served in a branded thermal mug. Give your customers a beautiful item, which will accompany them in the mornings and throughout the day. A warm beverage to go, to warm their hands and to relax. 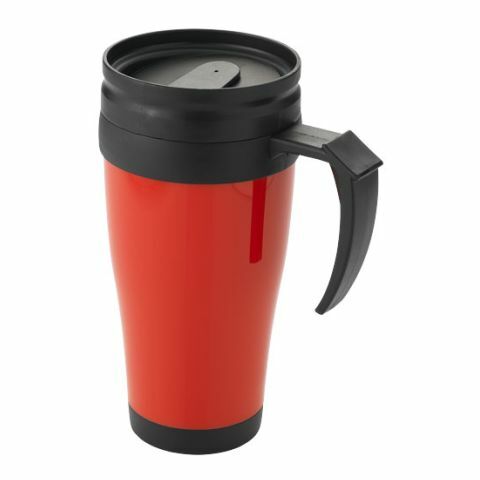 We at allbranded believe, that a thermo mug will be a brilliant promotional item. Your name will be associated with warmth, protection and the smell of coffee or tea, should you decide to use thermal mugs as promotional products. 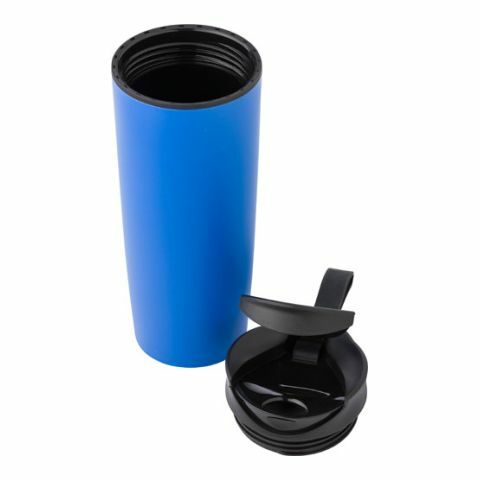 Thermo mugs are insulated drinking containers for your beverages. Their appearance does resemble the appearance of a mug, which was already used in 10.000 BC. The principle of insolation, which is being used with the thermo mugs, can be traced back to the Scottish chemist and physicist James Dewar. In 1874, he started to work on the development of an insulated container. The double walled transport and storage containers, which were made out of mirrored glass, have completed development in 1893 and were called Dewar – Containers. Without any connection to the discovery of the Scottish scientist, a German professor called Adolf Ferdinand Weinhold, also discovered the Insulation principle and mentioned a vacuum-jacket bottle as a predecessor of today’s thermos flask in his writings. From being one of the most popular promotional items, these thermo mugs still had a long way to go. The first steps, towards commercialisation, have been made by Reinhold Burger. He used the idea of the vacuum jacket, researched potential applications and patented the insulated mug in 1903. In 1909 he sold the patent to the Thermos plc., which made the insulated mugs market ready and presented them at an exhibition. Nowadays, thermo mugs cannot be amiss. Whether on the way to work, university or school as well as to meetings or at the airport; thermo mugs are one of the most popular items on the go. As branded promotional mugs, they are appreciated by the target audience, being one of the more premium promotional items. The user value of these promotional products is very high. Hot drinks are very popular, be it coffee, tea or hot chocolate. Everyone has their own preferences when it comes to hot beverages, which lifts the mood in the morning or brings warmth on a cold winter evening. It is even better when you can ignore the queue at the coffee shop by taking your hot drink from home. Thanks to the insulation of the mug, the drink will stay hot throughout the whole journey. The next piece of information may be unbelievable. 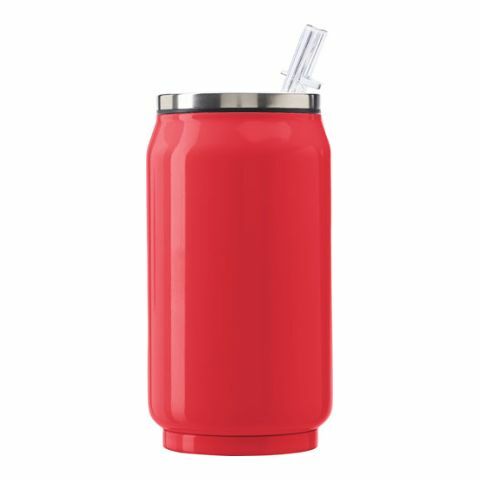 The insulated, promotional thermo mugs cannot only keep hot beverages hot, but they also can keep cold drinks cool in the summer. If that is not an awesome user value, then we don’t know! As promotional items, printed mugs offer a great advertising space, user value as well as versatility. The premium quality will not only bring out your logo or slogan, but also make customers, business partners and co-workers happy. If premium quality and design is important for you in terms of customer acquisition, then promotional mugs are the perfect item for you. Give a little bit of happiness to grumpy morning people, by giving them an item, perfectly suited for the breakfast to go. The user value is very high with this product and will make a good impression on your target groups as well as existing customers. By using promotional products such as these, it will be instantly clear: You value your clients and he/she is the king/queen. You are taking care of your customer’s wellbeing, as you want him or her to remember and associate you with feelings like warmth and comfort. With thermo mugs as promotional items, you will remain in their memories for a long time. Furthermore, these printed mugs can attract the attention of potential customers, generate many brand impressions and increase brand awareness for your company. With the promotional from allbranded, your advertising message will accompanying many people throughout their day. Your merchandising will be most effective, when you choose comfortable situations to distribute your promotional merchandise. As soon as the thermo mug fits the occasion, the holiday or the company event, your advertising effect will increase even more. A whole idea cluster will develop in your clients’ minds, which they will associate with your promotional product. If you would like to increase the product recall in the customer’s minds, you should use promotional items at Christmas events filled with mulled wine or at summer festivals, filled with fresh iced tea. You can also give the thermo mugs, personalised according to your corporate design, to co-workers, clients or business partners as a gift. This way your company will benefit from the generated advertising effect. But even at the end of a client meeting, you can give the thermo mug as a thank you gift. Thermo cups are the perfect advertising space, which can be personalised in the allbranded online shop, in order to advertise in the public. They are very authentic as promotional items, because the user itself has decided to receive this item. The category ‘thermo mugs’ in the allbranded online shop distinguishes itself through a large selection: Should your promotional items be with out without a handle? Should it be colourful or silver? Made out of premium steel of ceramics? Decorated via silkscreen print or laser engraving? When deciding which version you would like to purchase, we can offer you versions made out of plastic, long-lasting versions made out of ceramics with a silicon lid, or premium and very durable ones made out of premium steel. These can also be personalised according to your wishes, or brand specific designs. This way, you can develop your own personalised thermo mug. The promotional mugs are really popular items. Whatever version you may end up choosing, you can count on their immense advertising effect. Of course, we at allbranded, even have in this category, special items for you. We stock, for example, insulated mugs, in which you can integrate pictures or photos. They can be changed at all times and according to your mood. The thermal mug ‘Americano’ is also worth a second look. Thanks to its ribbed silicon manchette, it offers you additional wearing comfort and heat protection. We furthermore recommend the thermal mug ‘Arizona’. This one incorporates an integrated container, which can be used for coffee pads, cookies or sugar. A thermo mug, which has already been awarded, can also be found at allbranded. 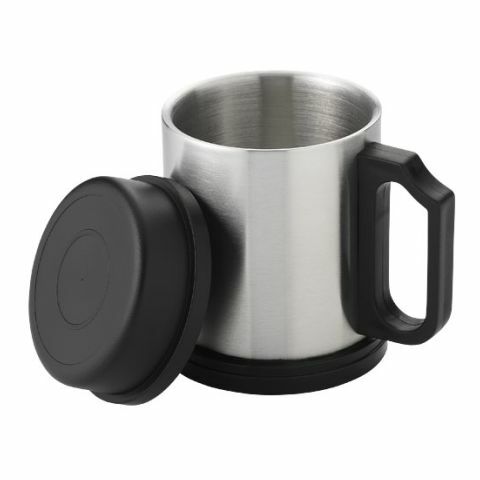 This thermo cup incorporates a silicon pad, which adds even more slip resistance. Furthermore, it also contains a push button, which makes it easy to handle with one hand and is therefore suitable for transportation. The leak-proof thermal mug is winner of the IF award 2014 and the Red Dot-Winner 2014. Take a look at our allbranded promotional thermo mugs and decorate your promotional gifts with a print or engraving.